Have you heard the joke, “Is your toilet running?” “Well, then go catch it.” While this may put a smile on your face, if your toilet is really running, flushing on its own, or leaking water, it can be no joking matter. I mean, honestly, who wants their toilet to not work correctly – especially if it’s the only toilet in your house? 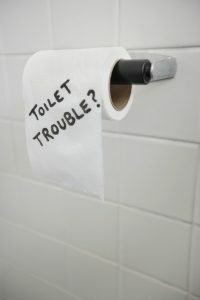 Have you ever heard your toilet tank spontaneously refill with water like it’s just been flushed? Don’t worry. Your house isn’t haunted by a toilet-flushing poltergeist. This phenomenon is known as a phantom flush. It’s caused by a very slow leak in the tank – most likely from a bad flapper or flapper seat. A food coloring dye test can confirm this is what’s going on. Once the toilet has refilled, add food dye to the tank. Wait 10 to 15 minutes. If the bowl water is colored, the flapper is not sealing completely. To fix the problem, install a new toilet flapper. The lift chain has fallen off the handle lever, or it has kinked, preventing the flush ball or flapper from properly seating. Hook the lift chain back onto the handle lever or unkink it. The toilet fill valve isn’t sealing. Check for and remove any mineral deposits around the seat beneath the valve. Also, check the valve for wear and tear. If it’s worn, replace it. The float ball is out of adjustment. Bend the float arm slightly downward so the float ball will reach the shut-off level sooner. The water level in the tank is too high, causing water to run into the overflow pipe. Adjust the water level in the tank so it’s about ½ inch below the top of the overflow tube. Condensation can form on the side of the tank during warm humid weather. Make sure your bathroom is ventilated properly. Or, you may want to get a toilet liner kit. Your toilet tank may be cracked. If so, you’ll need to buy a new one. The water supply line, which provides water for your toilet, may have a leak. Potential leak sites include: 1) the connection where the valve attaches to the water supply; 2) the connection where the supply line connects to the water shut off valve; 3) the valve stem seal on the water shut-off valve; and 4) the connection where the supply line connects to the toilet fill valve. A standard toilet has about four seals which may spring a leak. If you have a leak due to a faulty seal in any of these cases, you’ll need to replace it. Seal sites include: 1) Between the tank and the bowl; 2) at the mounting bolts; 3) at the base of the ballcock; and 4) On the plastic flange underneath the toilet base. In some of these cases, like a leak caused by a broken flange, you may require the help of a professional plumber, like those at Pipe Dream Plumbing, to make the repair. While most of the repairs for these toilet problems are easy enough for you to fix, if you encounter any issues during the repairs, or you simply don’t want to mess with DIY fixes, contact the plumbing experts at Pipe Dream Plumbing for a free job estimate. We have the knowledge and skills to quickly and easily fix your toilet with the least amount of disruption. And, if you have major toilet problems, like a severe water leak, or a raw sewage backup into your home, or you’re just not sure what’s causing your toilet issues, don’t even try to fix these problems, give Pipe Dream Plumbing a call at 317-388-1988 to schedule an appointment. We even offer emergency services. Turn your toilet nightmare into a better day with the help of Pipe Dream Plumbing.